Oriana's entertainment lounge where during the day guests can take part in craft classes, listen to guest speakers or watch a cookery demonstration, and at night comedy and cabaret is on offer along with game shows such as Deal or No Deal, 60s and 70’s party nights and crews talent shows. The lounge includes a full-service bar and a large wooden dance floor that comes alive at night. A tribute to the world-famous Lord's Cricket Ground, the British style sports bar is decorated in cricket memorabilia with the wall adorned by a 2.3m high by 8.8m long, hand-painted mural of Lord's, with life-sized figures. The Tavern also features a canopy above the bar, reminiscent of the awning over the stands at Lord's along with a green carpet with a cross-mowed lawn effect. 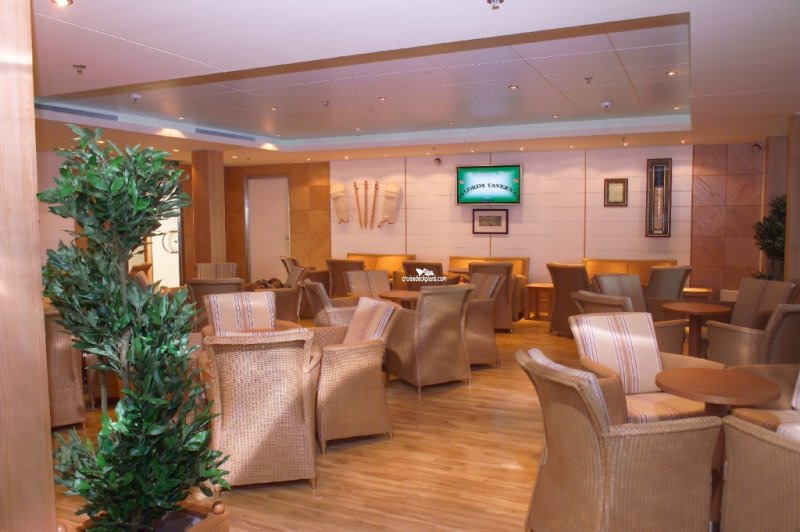 Offering sea views, there is seating both inside and outside on deck (starboard side) with umbrellas offering both shade and protection from inclement weather. Entertainment ranges from live music and bingo to karaoke, interactive bowling and virtual horse racing events on the big TV screen which also airs a number of sporting events (subject to satellite connectivity). Oriana's largest nightspot. Featuring a pair of Harlequin figurines at the entrance, Harlequins has an in-laid, wooden sprung floor, which offers a large open space ideal for ballroom, Latin and sequence dancing or Zumba classes during the day. In the evenings, the floor area is reduced to a small intimate space for a late night disco with lighting and high-tech sound equipment and the latest tunes to dance to. Casino with roulette, blackjack and poker tables for guests to play at along with a selection of slot machines and experienced staff to teach guests how to play all the games if required. Features paneled walls, deep sofas, comfortable club chairs, classical paintings and traditional rugs to emulate the ambience of a time-honoured London Club. Anderson's is ideally located for a break from the tables in the Monte Carlo Club, pre-dinner drink or warming nightcaps. The room takes its name from P&O founder Arthur Anderson and a bronze bust of him forms part of the decor. Featuring a traditional theatre colour scheme of rich red, blue, gold and maroon, combined with a Shakespearean Tudor rose motif and heraldic design, the theatre is the location for the ships West End style productions. The Theatre Royal also has the very latest technical advantages, with high-tech audio, video and lighting equipment and a revolving stage on which a different musical spectacular takes place every night.